The business-friendly policy of West Bengal government is slowly bringing energy to the lifeless residential market of Kolkata. Launch of new projects by renowned developers along with Investment by IT firms led to a rise of two per cent in the city’s realty market. 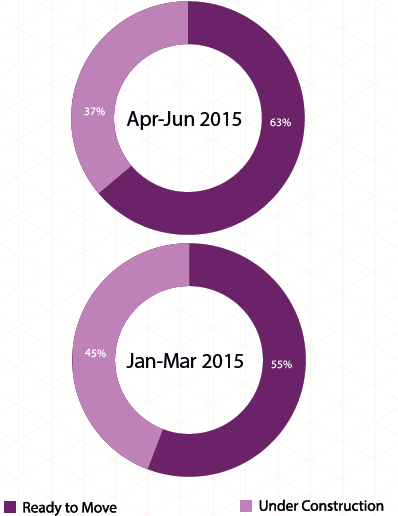 Demand for office space increased in Kolkata in the first six months of 2015. Several national and multi-national companies invested in office spaces here. Most of these transactions took place in Salt Lake Sector V and New Town areas. Such transactions are likely to increase further. The state government’s announcement on relaxation of Floor Area Ratio (FAR) had a positive impact on the realty market. The move is expected to drive the development of spacious buildings in the city. Major developers such as Godrej Housing, Ashiana Housing, Salarpuria Sattva and Merlin Group, among others, launched residential projects in the city. State government’s new policy for ‘theme-based’ townships got thumbs-up from the developer’s community. National Institute for Smart Governance (NISG) submitted a plan to develop New Town as a Smart City. The area is witnessing a facelift by New Town Kolkata Development Authority (NKDA), which has installed LED lights and solar rooftops; and is in the process to launch a net metering system. With depleting water table, Kolkata is facing major water woes, chiefly in localities along the EM Bypass. This has impacted the rental market adversely. Foreign Direct Investments (FDI), especially from Singapore based companies, increased in the city. 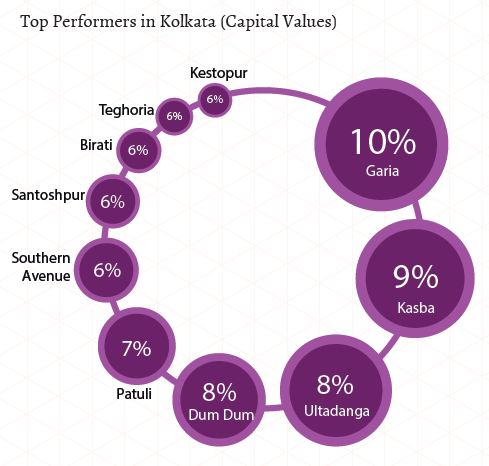 About 75 per cent of the localities in Kolkata registered a rise in capital values in Apr-Jun 2015. The city clocked an average two per cent rise in property prices. Buyer and developer sentiments improved owing to the key annoucements made by the state government. Areas close to the upcoming metro corridor registered growth in property transactions. Localities such as Garia, Joka and Barasat benefited from their proximity to the metro, which would ease commutation once completed. Major real estate developers invested in areas such as Barasat, Baruipur, BT Road, Joka and Sonarpur. Most of these localities are currently at nascent stages of development in terms of physical and social infrastructure. Garia witnessed the highest rise in property prices to the tune of 10 per cent in Apr-Jun 2015, as against Jan-March 2015. Most of the inventory here is new or under-construction. Kasba, a developing locality situated close to EM Bypass, saw property prices propelling by nine per cent. This could be attributed to new project launches in the area. Nearby areas - Ultadanga and Dum Dum recorded an eight per cent rise, each, in capital values in the said period. Property prices in Patuli, a suburban locality of South Kolkata, saw seven per cent rise in the last six months. Localities which witnessed a drop in capital values include Jessore Road, Joka, Lake Town, BT Road, Kalikapur. A dip of three to eight per cent was witnessed in these areas. Over 60 per cent of the localities in Kolkata registered a rise in rental values in the last one year (Apr-Jun 2015 against 2014). Highest rise of 14 per cent in rental values was witnessed in Jadavpur and Salt Lake. Salt Lake witnessed an increase in commercial activity with many IT/ITeS firms setting base in the area. The growing working population impacted the rental market positively. Jadavpur, on the other hand, benefitted from the presence of various educational institutions and colleges in the vicinity. A nine per cent rise in rentals was witnessed in both Behala and Chinar Park in the last one year. The localities largely offer 2BHK and 3BHK units on lease. Rental values increased by seven per cent in Kasba. Its easy accessibility via the EM Bypass and Rashbihari Connector plays a major role in attracting tenants to the area. The locality is set to benefit from the upcoming metro station situated just a km away from the region. Tollygunge witnessed a seven per cent rise in rental values in the last one year. The locality majorly houses multi-storey apartments. Ballygunge and Prince Anwar Shah Road registered a four per cent rise, each, in rental values in Apr-Jun 2015, as compared the same quarter last year. Several residential projects along the Anwar Shah Road were delivered during the said period, increasing the rental stock in the area. Much to the relief of homebuyers, Kolkata witnessed an increase in supply of ready-to-move-in properties in Apr-Jun 2015, as compared to the previous quarter. The city also witnessed an increase in the availability of properties within Rs 25 lakh during the same period. Supply of residential apartments in Kolkata increased nominally in Apr-Jun 2015 and stood at over 85 per cent. Majority of this supply (over 40 per cent) was concentrated in the south zone of the city, followed by north zone, which had almost a quarter of the total supply. The city had an almost equal division of ready-to-move-in and under-construction properties. Supply of builder floor units stood at eight per cent in Apr-Jun 2015. This property type was predominately available in South Kolkata. Out of the total inventory in the zone, more than half of the properties were builder floor units. Out of the total properties in West Kolkata, almost 70 per cent were residential apartments. The rest of the inventory had an almost equal share of independent houses/villas and builder floors. In Kolkata East, however, which is witnessing maximum residential development, residential apartments constituted 97 per cent of the total share, signalling little presence for other property types. Similar to the previous quarter, supply of independent houses/villas remained timid at just six per cent, most of which was available in north and south zones of the city. In Apr-Jun 2015, most of the properties in the city were offered in the affordable housing segment (within Rs 25 lakh), in contrast to Jan-Mar 2015 where supply was high in the mid-income housing segment (Rs 25-40 lakh). This hints towards the growing focus on affordable housing in the city. 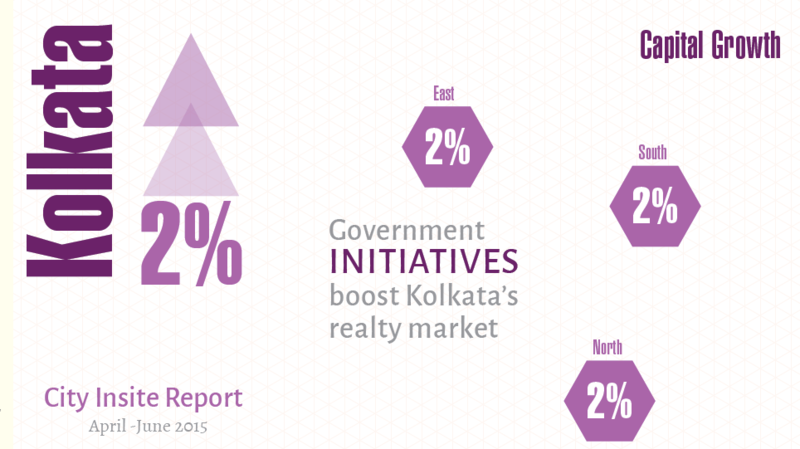 Supply of properties within Rs 25 lakh increased by four per cent in Kolkata during Apr-Jun 2015. Over 60 per cent of the properties in the category were ready to occupy. Supply of luxury housing (Rs 60 lakh-1crore) and ultra-luxury housing ((Rs 1-5 crore) segments remained stable in the said quarter. About 80 per cent of the properties in the ultra-luxury segment were ready to move, while the rest were under-construction. In Central Kolkata, out of the total properties available, most fell under the ultra-luxury housing segment. 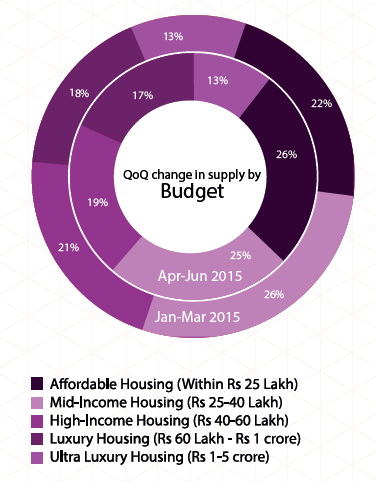 Supply of high-income housing segment (Rs 40-60 lakh) dipped by two per cent in the quarter ending June 2015. About 60 per cent the properties in this segment were ready to occupy. About half the total supply of properties in the mid-income housing segment (Rs 25-40 lakh) were under-construction. In South Kolkata, out of the total properties available, most were available in this budget category. 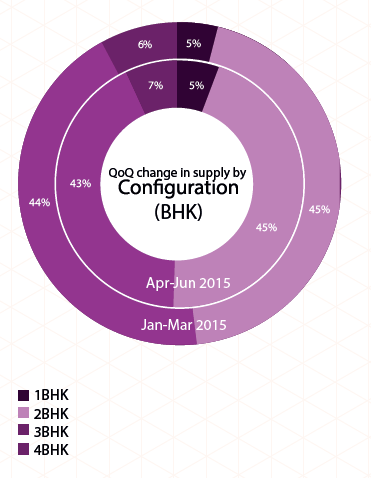 Supply of residential apartments configured as 2BHK units stood at 45 per cent in Apr-Jun 2015. A nominal dip was observed in supply of 3BHK units, while supply of 4BHK units increased by the same percentage in the said quarter. Among all zones, supply of 1BHK units was predominantly concentrated in North Kolkata with 38 per cent availability, closely followed by South Kolkata which recorded 36 per cent supply. There were hardly any 1BHK units in Central and East Kolkata. South Kolkata witnessed the highest supply of 2BHK, 3BHK and 4BHK units among all zones. In Kolkata West, half of the inventory was configured as 2BHK units, while almost one-third was configured as 3BHK units. On the contrary, almost half of the available properties in East Kolkata offered 3BHK units, while 40 per cent were 2BHK units. 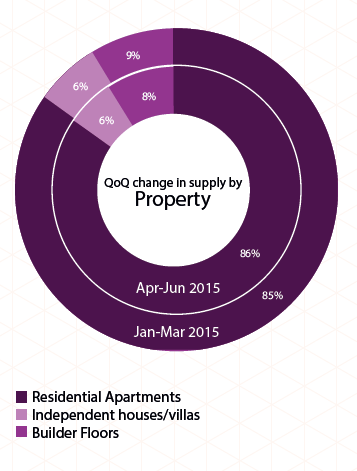 In Apr-Jun 2015, Kolkata saw an increase in supply of ready-to-move-in properties. The category recorded 63 per cent supply, eight per cent higher than the previous quarter. Supply of under-construction properties in the city dipped by eight per cent during the said period and stood at 37 per cent in Apr-Jun 2015. This could be due to a lot of developers withdrawing new project launches owing to the piling stock of unsold inventory in the city. Out of the total ready-to-move-in and under-construction properties in Kolkata, almost one-third share of both the categories was concentrated in East Kolkata, closely followed by South Kolkata. Out of the total supply of under-construction properties in the city, most were available in the mid-income housing segment (Rs 25-40 lakh). On the other hand, most of the ready-to-move-in properties were available in the affordable-housing segment (within Rs 25 lakh). In North Kolkata, majority of the properties were ready-to-move-in. Whereas, out of the total inventory in South Kolkata, 66 per cent were ready to occupy.